The purpose of buying traffic is to put your message or offer in front of the right audience. And the truth is (assuming you have a product or service that people want), the biggest reason that your traffic campaigns are failing is because the targeting is off. The key to solid targeting is SPECIFICITY. A few weeks ago, Facebook released a revolutionary new way to target your audience. It’s called “Flex And-Or Exclusion” targeting. Although this feature has been available via the Facebook API and third party software for some time now, it’s just now rolling out to the general public. To check out the new targeting, you must be using Power Editor (for the time being). 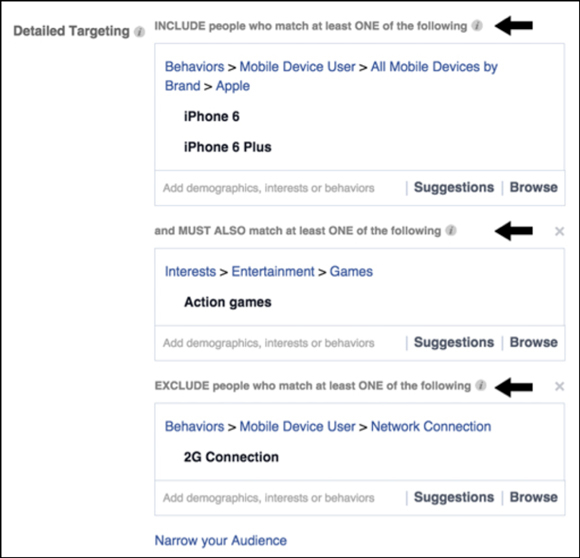 You’ll see the options in the “Detailed Targeting” section when setting up your ad set. 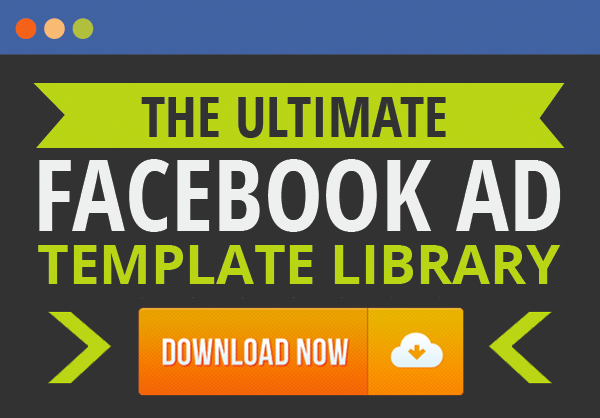 This is one of the most revolutionary changes to the Facebook ad platform to date. 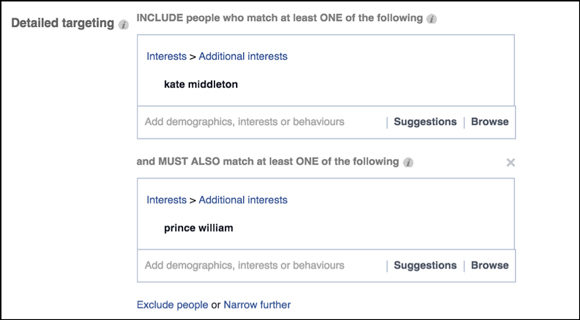 You can now choose to include people who match more than one interest, demographics, or behaviors at a particular time. You can choose to EXCLUDE particular demographics, interests, or behaviors. It allows us to get SPECIFIC. Before, there were no “and” statements. When we would enter new interests, demographics, or behaviors we were choosing to target everyone who fit ANY of those qualifications. It was way more BROAD. This allows you to get specific. Refer back to the graphic above…. the orange area in the middle is your sweet spot. Before, we would have had to target everyone in that image all at once. Let’s think about this new feature in terms of the way we teach targeting here at DigitalMarketer. When we’re looking to run ads to a new offer, or in a new market, we first start by doing a TON of research on the target audience. Where are these people hanging out online? How can we find the people that love this market SO much that they want to spend their money on it? We answer questions like these…. What’s SPECIFICALLY UNIQUE about this group of people? The most important question above is the last, what’s specifically unique about these people? Where would they be hanging out that NO ONE else would? 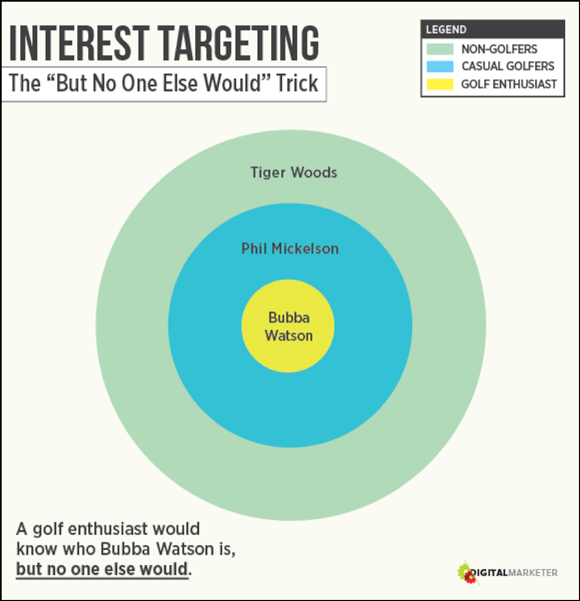 Let’s look at a targeting example in the golf niche. Say you’re selling golf equipment. You want to run ads to people who actually PLAY golf… frequently. And, therefore, buy lots of golf stuff. Most people would hop into Facebook (or any traffic platform) and quickly fill out the targeting section. They may target Tiger Woods. Why not? He’s probably the most famous golfer of all time. Tiger is too well-known. He is an international celebrity. Most people know who Tiger is, whether they watch or play golf at all. He’s definitely not as well known as Tiger, but he’s still pretty famous. I don’t play golf, but I know who Phil Mickelson is because I’ve watched the Master’s with my dad. So then you get to the “But No One Else Would” trick…. Who or what can we target that ONLY golfers would be interested in? What about a more mid-level golfer? Although Bubba is a big enough name to have a following that you can target on Facebook, he is still lesser-known and therefore would attract people who actually watch golf, play golf and… yep… buy golf stuff. What events do golf enthusiasts attend, but no one else would? What magazines do golf enthusiasts read, but no one else would? What books do golf enthusists read, but no one else would? If you use this simple fill in the blank sentence when planning out your targeting, it will ensure that you’re actually reaching a relevant audience! A ___________ would know who ___________ is, but no one else would. What does this have to do with Facebook’s new targeting options? Now, you can still leverage those “broader” interests like Tiger Woods without worrying about them being too broad…. You just have to qualify them with an “and” statement. 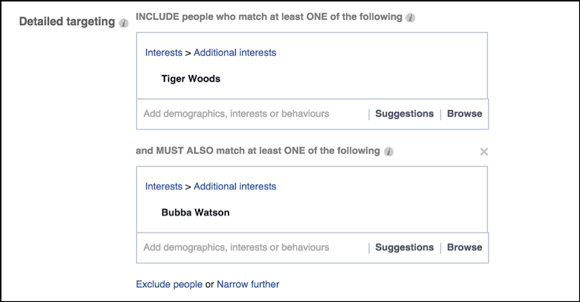 Instead of people that just like Tiger Woods – we’re targeting people who like Tiger Woods AND Bubba Watson. It’s allowing you to tap into the part of Tiger’s market that would be still be hyper- focused. Let’s say we’re wanting to target people who really LOVE the royal family. We’re still testing the new targeting options and I’m excited to report back very soon with more data. 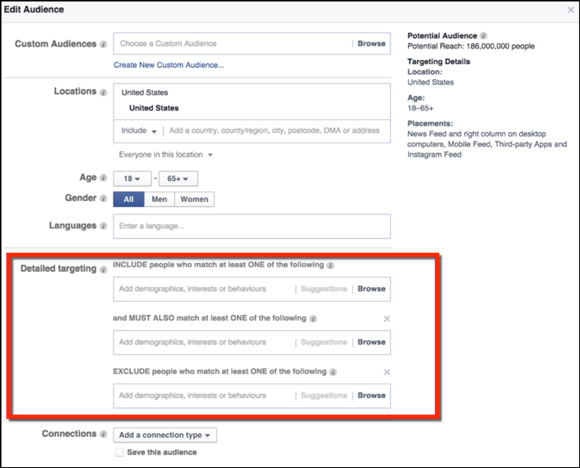 For the time being, take advantage of the further specificity that Facebook Flex Targeting has given advertisers. 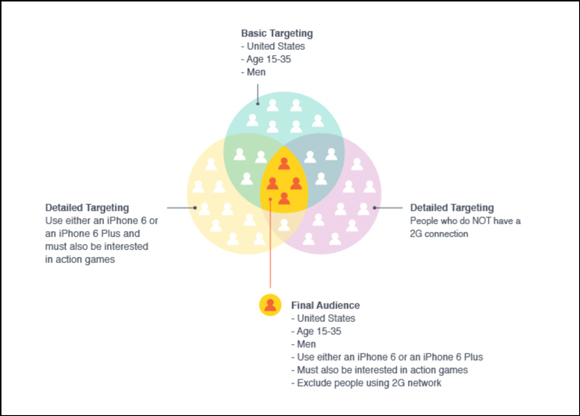 Have you started playing with Facebook’s Flexible Targeting? What questions do you have?